Will The Samsung Galaxy Tab Really Challenge The iPad? The tablet market has been flooded with devices of all shapes, sizes, operating systems and brands, but as of yet no one has been able to challenge Apple's seeming market dominance with its iPad tablet. Will a slightly smaller, open source-based competitor from Samsung be the one to finally slay the dragon? Rumors have been circulating, and circulating that the Samsung Droid Tab was getting closer and closer to release, and finally the company took the official wraps off of it today, and … not too shabby, we must say. You can see the full spec list down below, but it definitely picks up the ball in some spots where Apple dropped it. Of course some of the other major aspects is the full certification by Divx, support for Flash, expandable memory, you know, all the little things Apple doesn't feel you need, so they don't give them to you. The problem is that before we get too excited, the official announcement is missing some key pieces of information such as which carriers it will work with and how much it will run you. Apparently the prices will be determined by each carrier, and those announcements will come next month when the device begins releasing in the United States and Europe. Until that time we're going to have to withhold our interest, but we have to say it definitely has grabbed our attention. Personally, I think the biggest issue for me is that it would be another blasted contract. You can't really replace your phone with this device, and depending on pricing, the only affordable way to purchase one might be under a subsidized contract. Yes, it has Wi-Fi support, but that would mean no contract and hence no subsidy … you see where I'm going with this. Until we hear pricing, it looks like this device resides in some sort of weird limbo for mobile devices where it doesn't really replace any thing, but might make a really nice mobile Internet device. As soon as we hear pricing, minds will be made up, but until then, it's nice to dream this thing will be affordable as you look over the specs. What say you? 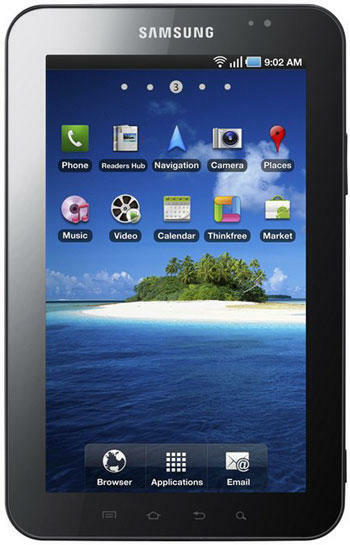 Are you interested in the Samsung Galaxy Tab?